This book seemingly has it all when it comes to Pirate lore. It feels as though no stone was left unturned in revealing (if at least anecdotedly) the broad scope of the history of piracy on the high seas. Where possible, the author goes into much detail. But with a few of the stories, he can only offer what history has uncovered which can be very little when it comes to the topic of Pirates. When this book was first written in 1995 (the edition I'm reading), the Information Age was just barely picking up steam. Today, however, much of the information found in this book is also logged in wikipedia or other sites. But without this book, learning about such a broad topic via wikis would be time-consuming and dis-organized. Cordingly's book, therefore, provides a nice one-stop shop to get the bulk of information on Pirates. Below is a list of links I've found as I read the topics covered in the book. I've placed an asterisk next to those topics I partcularly enjoyed. Sam Bellamy; Whydah; Edward Low; Charles Vane; William Dampier; A nice list of Pirate authors; *Bartholomew Roberts. 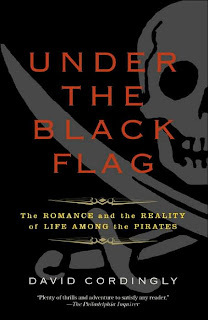 Chapter 6: Into Action Under the Pirate Flag is a really fascinating chapter which delves into how pirates tortured, attacked, and lived at sea. I highlighted one section of this chapter which describes Bartholomew Roberts. "Not only was Roberts a natural leader, but he also proved to be absolutly ruthless. His attacks were swift and savage, and he had no qualms about resorting to torture and murder to achieve his ends. During the course of the next three years he caused havoc among the merchant shipping on both sides of the Atlantic. In 1721, at the height of his career, Roberts commanded a squadron of four vessels. His flagship was the Royal Fortune of forty-two guns, a former French warship. His consorts were the thirty-gun brigantine Sea King, the French ship Ranger and a small ship of sixteen guns which was used 'as a store ship, to clean by.' The total number of men under his command at this time was 508." Another section from chapter six describes a little of red flags and their meaning. "There was an alternative meaning tot he plain red and black flags. A French flag book of 1721 includes hand-colored engravings of pirate flags, including a black flag with various insignia, and a plain red flag alongside a red pennant. Under the red flags is written "Pavillon nomme Sansquartier" ("Flag called No Quarter"). The idea that a red flag could mean no quarter is confirmed by Captain Richard Hawkins, who was captured by pirates in 1724. He later described how "they all came on deck and hoisted Jolly Roger (for so they call their black ensign, in the middle of which is a large white skeleton with a dart in one hand, striking a bleeding heart, and in the other an hourglass). When they fight under Jolly Roger, the give quarter, which they do not when they fight under the red or bloody flag." *Alexander Selkirk (marooned on an island for 4 years). The last few chapters about how pirates were caught and tried and died and how England squashed piracy all together in the Caribbean were quite fascinating. It is interesting to note that as soon as England put it's mind to it and began focusing on destroying the pirates, they were able to do so quite easily. The main reason piracy went on for so long was because there was no force large enough to take the pirates on. Once the Royal Fleet began engaging the pirates, piracy quickly came to an end. If I ever get the chance, I'd like to read the book entitled The Republic of Pirates by Colin Woodard. It sounds like it delves deeply into the history three pirates (Bellamy, Blackbeard and Vane) and the man who brought an end to piracy in the Caribbean (Woodes Rogers). Why such an interest in Pirates? Indeed this was a fascinating book with lots of history in it to soothe the pirate of any of us.